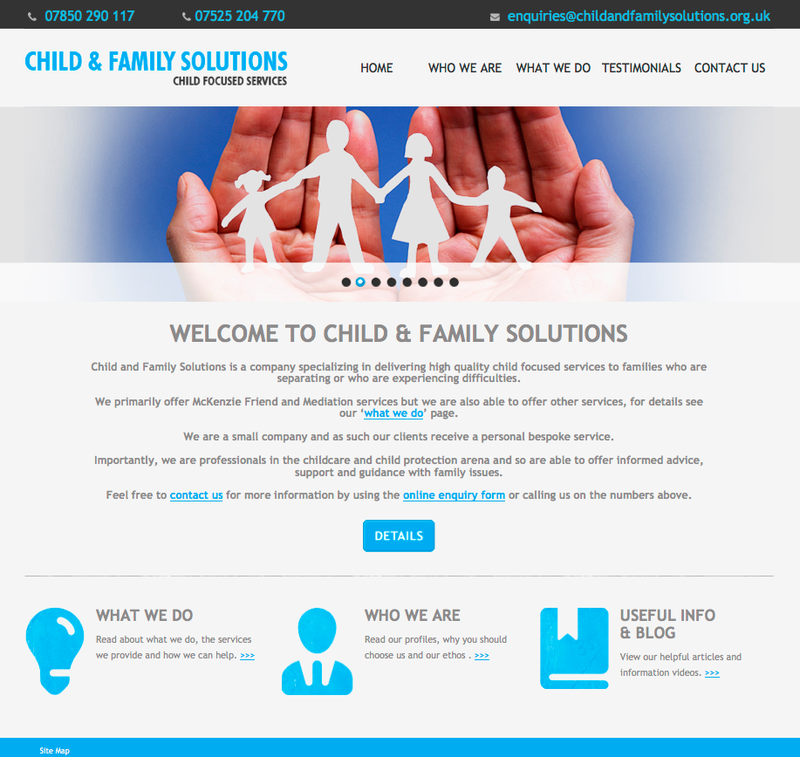 Our Website for this Week goes to Child and Family Solutions Ltd. It's a wide website which results in a very modern and fresh online look for the business. The overall design is very gentle and minimalist whilst retaining a certain emotional warmth. Perfect for the work that the client does and the tone they want to demonstrate to their website visitors. The Home page features a beautiful moving slider that features very moving (pun intended) images. Though a slider these days is a website design staple, don't be tied down to just using basic images. For example, this one uses beautiful fade effects at the top and the bottom that add to the width of the site as well as a clever graphic that illustrates which slide in the sequence is displaying and how many there are to see. Furthermore, if you're looking to have something more content-relevant on your internal pages, but still using the same style choices, that can certainly be arranged with custom headers as seen on the Child and Family Solutions website. Although the website is obviously very clean and simple, it doesn't mean that it can't also be signature and bespoke looking for branding purposes. We feel that the custom icons on the Home page are lovely and really help the overall look of the page. Similarly, so do the specially-made social media icons on the Contact page. It's also worth mentioning the efforts the client has made behind the scenes of the website and with its content. There is lots of text on each page, which gives the client lots of chances to mention their chosen keywords for the Search Engines to find. As well as this, the client has a Dynamic Sitemap set up to help Google and other Search Engines discover any changes made quickly and help index the website more often. As a result, both of these both of these will help the website get higher in Google over time. Feel free to read the SEO guide from our Support Page for more ways to help your website achieve better Search Engine Results. "There's nothing to improve on and the whole process is efficient and fast."